Turkish and mud baths, diving, and good swimming on the beaches invite the lazy to linger, and sights like an ancient amphitheater keep the historically minded traveller engaged. A great city with a diverse atmosphere. Tourism combined with local culture combined with ancient history combined with stunning natural scenery in the surrounding peninsula and coves. 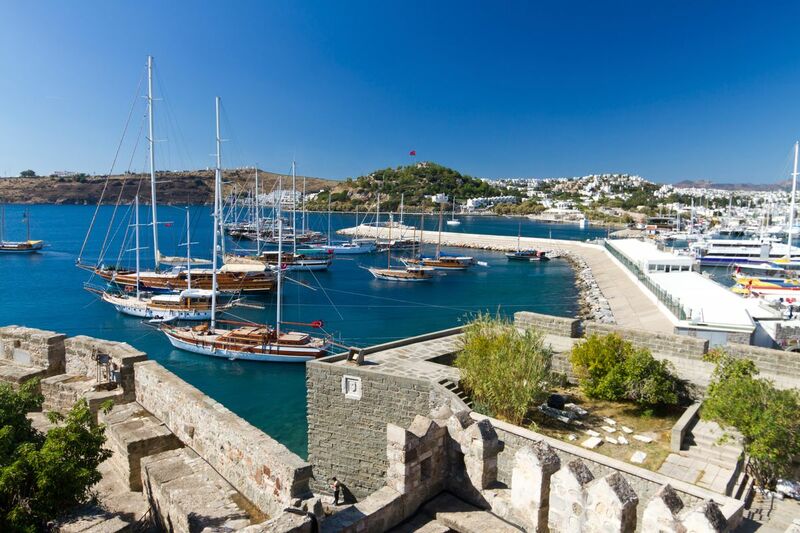 Bodrum was conquered by Alexander the Great and is home to the ruins of one of the Seven Wonders of the Ancient World. Beyond that it's gorgeous. It sits right on the Aegean directly opposite the Greek island of Kos. The only drawback is that it's so popular with tourists that the town is given over a bit to cheesy nightclubs and generic food. The town from which the Bodrum Peninsula takes it's name. Bodrum is a chic, cosmopolitan town which is equally comfortable as a home to trendy yachting types with it's substantial Marina and Yacht Club; independent travellers with a large number of small hotels and hostels; and a number of large all-inclusive sea-front hotels for European package holiday makers. The other towns on the Peninsula act as dormitories for the main town, as Bodrum itself doesn't have much of a beach. The young at heart tend to stay in Gumbet, which is to the west of Bodrum, while Bitez is for those seeking a quieter pace. The ubiquitous Dolmus (shared-minibus) makes getting around the Peninsula reasonably quick and straightforward. Bodrum has fantastic markets. You can buy what ever Christmas presents you want from the big to the bizaar. It has masses of markets, you can also buy jewelry and handbags for a discounted price. very good for girlfriend or mother presents Be prepared to barter for them, Haggle Haggle! For those seeking excellent weather and a beachy relaxation, with zero doubt that its crystal clear sunny sky with a little breeze all summer, Bodrum is a good destination. Not to forget a very crowded nightlife that starts at 1:00 am! Didn't too much appreciate the mean attitude and avarice of the Turkish people, their lack of hospitality and honesty. A bit touristy. But, it's a good jumping off point to see the southern coast. Great town full of history, Sunday market a must. Ferry's out to local islands and even Greece! We liked this resort town in Turkey. The atmosphere and the people seemed very friendly and open to the tourists. There is a huge number and variety of restaurants along the harbor road. We enjoyed our walk from one end of the harbor to the other looking at the boats, stores, restaurants and the people.